In late October 1929 the stock market crashed, wiping out 40 percent of the paper values of common stock. When the stock market crashed in 1929, it didn’t happen on a single day. Instead, the stock market continued to plummet over the course of a few days setting in motion one of the most devastating periods in the history of the United States. The most significant events started on Black Thursday, October 24, 1929. On that day, nearly 13 million shares of stock were traded. It was a record number of stock trades for the U.S. J.P. Morgan and a few other bankers attempted to bail out the banking system using their own money. They were unsuccessful. Their move led to a slight increase in stock price on Saturday, October 26. But over the weekend many investors lost faith in the stocks and decided to sell their shares. 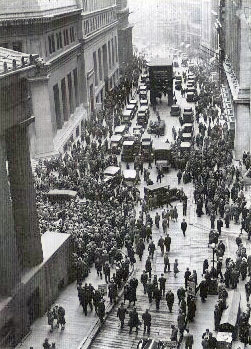 When the markets reopened on Monday, October 28, 1929, another record number of stocks were traded and the stock market declined more than 22%. The situation worsened yet again on the infamous Black Tuesday, October 29, 1929, when more than 16 million stocks were traded. The stock market ultimately lost $14 billion that day. The stock market crash crippled the American economy because not only had individual investors put their money into stocks, so did businesses. When the stock market crashed, businesses lost their money. Consumers also lost their money because many banks had invested their money without their permission or knowledge. Even after the stock market collapse, however, politicians and industry leaders continued to issue optimistic predictions for the nation’s economy. But the Depression deepened, confidence evaporated and many lost their life savings. By 1933 the value of stock on the New York Stock Exchange was less than a fifth of what it had been at its peak in 1929. Business houses closed their doors, factories shut down and banks failed. Farm income fell some 50 percent. By 1932 approximately one out of every four Americans was unemployed. 4) The stock market crash completed the debacle. After Black Thursday, what rule was safe except Sauve qui peut? And businessmen, in trying to save themselves, could only wreck their system; in trying to avoid the worst, they rendered the worst inevitable. By shattering confidence, the crash knocked out any hope of automatic recovery. 5) In sum, the federal government had encouraged tax policies that contributed to over-saving, monetary policies that were expansive when prices were rising and deflationary when prices began to fall, tariff policies that left foreign loans as the only prop for the export trade, and policies toward monopoly which fostered economic concentration, introduced rigidity into the markets and anaesthetized the price system. Representing the businessmen, the federal government had ignored the dangerous imbalance between farm and business income, between the increase in wages and the increase in productivity. Representing the financiers, it had ignored irresponsible practices in the securities market. Representing the bankers, it had ignored the weight of private debt and the profound structural weaknesses in the banking and financial system. Seeing all problems from the viewpoint of business, it had mistaken the class interest for the national interest. The result was both class and national disaster. “Sounds of the Crash” – On the 70th anniversary of the great stock market crash of October 29th, 1929, Marketplace presented an audio collage of music resulting from that event. Peter Stenshoel’s collage is announced by host, David Brancaccio. The Crash of 1929 (1990). Documentary film from BBC2. I saw a portion of a documentary about the 1929 stock market crash. In it a man bought a newspaper and saw an article, which caused him to go to the Bank of the United States to sell his shares of stock. The documentary stated that this was the main flash point triggering the stock market crash and the ensuing Great Depression. The documentary noted that the New York Times did a story on the man and after all this time no one has been able to identify him. I have a New York Times subscription and tried to find the article, but was unsuccessful. Can admin or someone else direct me to how to find that New York Times article or any other periodical that wrote on that specific matter? i am working a paper on the stock market crash of 1920 and this page has been helpful, amercia has gone through a lot of stuff but we are still standing. I think it is a good thing we went through all of this because it makes our what it is today. There are MANY today who need to read this article…from the White House to the home of the common man…though there may still be (in some instances) a racial divide in America, the divide between prosperity and poverty is ever widening. The debacle that now exists is living proof that we’ve learned absolutely NOTHING from history. The Gates and the Buffets of the world continue on. The “middle” try to maintain, while the “lower” try to get to/into the middleThe rich get richer and the poor…..
As the saying goes: Those who do not learn from history are condemned to repeat it.